Cons: DYL app is not reliable. 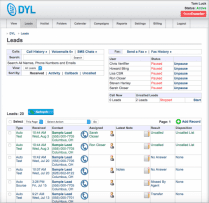 Our agency uses DYL and it works wonders for us! We have been using this service since we opened in May of 2017. It is very convenient and is great when we need to go back and listen to a call. The only issue we have had with DYL is when our internet is down, but that is obviously not their fault. Pros: Keeps our agency organized. DYL has allowed our office to effectively communicate with not only our current customers but with future new business we plan to write. DYL is an important aspect to our agencies day-to-day activities and without it, we would not be nearly as effective in reaching and servicing our book on a daily basis. We LOVE DYL! It has streamlined our day to day operations and opened up more time for us to do what we came to do, SELL! We utilize the Campaign Feature daily. Uploading our lead lists and having them automatically called has shaved hours a week off of my producers “dial time”. They are now able to call on average 30 more contacts on any given day as they no longer have to manually dial the numbers which has truly allowed them to hit their goal of 80 contact calls per day. The Calendar Scheduling Feature is another one we use constantly. Setting appointments that automatically call the customer at the time they are expecting has promoted that we are an agency of our word and we will call you back when we say we will. Our Customer Retention Rate has gone up 7 percent since switching to DYL as it manages my customer review schedule as well as my sales follow ups. DYL has truly empowered my staff and I to be able to be more efficient, punctual with follow-up, and generally happier while in the office. I feel that DYL’s impact on my business is truly immeasurable and it has become an irreplaceable part of it. Top notch work and I cannot thank you enough for the boost your product has given my business. We LOVE DYL! It has streamlined our day to day operations and opened up more time for us to do what we came to do, SELL! We utilize the Campaign Feature daily. Uploading our lead lists and having them automatically called has shaved hours a week off of my producers “dial time”. They are now able to call on average 30 more contacts on any given day as they no longer have to manually dial the numbers which has truly allowed them to hit their goal of 80 contact calls per day. The Calendar Scheduling Feature is another one we use constantly. Setting appointments that automatically call the customer at the time they are expecting has promoted that we are an agency of our word and we will call you back when we say we will. Our Customer Retention Rate has gone up 7 percent since switching to DYL as it manages my customer review schedule as well as my sales follow ups. DYL has truly empowered my staff and I to be able to be more efficient, punctual with follow-up, and generally happier while in the office. I feel that DYL’s impact on my business is truly immeasurable and it has become an irreplaceable part of it. Top notch work and I cannot thank you enough for the boost your product has given my business. 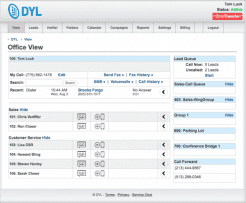 “DYL,” or Dial Your Leads, is an integrated phone and CRM system. By bringing these two systems together, sales agents will be able to contact more leads quicker, while automatically logging the information about the lead. The system sets up reminders to follow up with business calls, so no one falls through the cracks. Founded in 2009, DYL’s headquarters are in Marina Del Ray, California. – Follow up SMS text sent after phone call. Businesses where mere seconds can mean the difference between making the sale or losing it to a competitor. There’s an old saying in business that if you don’t shake your customer’s hand within five minutes of him walking through the door, your competition will. That’s an old saying, and by now, that five minutes has been squeezed to just five seconds. DYL ups the ante on timely response by letting its agents connect to leads in real time. When a potential customer fills out a form, sends an email, or otherwise indicates that he wants to be contacted, that information goes to an available agent, and the phone will ring immediately. There is no chance of the lead getting buried in a mountain of email. 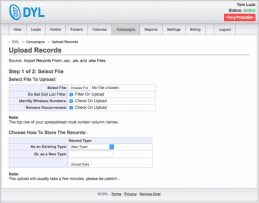 DYL has a number of systems in place to make sure the agent persistently follows up on the lead until the connection is made. Even if the agent doesn’t reach the lead right away, the DYL sets up automated reminders to the agent at regular (but not annoying) intervals. DYL gives agents tools for success that weren’t available just a few years ago. What Do You Think of DYL?